This article was originally published on the author’s blog, a paper bird. 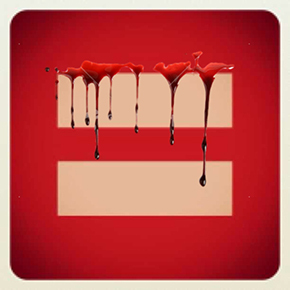 The Human Rights Campaign (HRC), the largest US gay organization, is going international. It’s just been given at least $3 million to spread the word of marriage equality to benighted countries that treat gays badly. Unfortunately, there’s a catch. Its chief partner and donor in this project wants the people in those countries, LGBT folk included, to starve–their economies wrecked, their incomes shipped abroad, their resources squeezed and stolen to pay off odious debt. HRC is receiving its money for gay rights in the Third World from the man who “virtually invented vulture funds”: a form of speculation that’s one of the worst contributors to Third World poverty ever. The need to support LGBT advocates and call out U.S.-based anti-equality organizations abroad has never been greater. […] At the same time, opportunities exist for a global equality movement as a growing number of countries are passing pro-equality legislation and recognizing marriage equality. Seventeen countries around the world afford, or will soon afford, committed and loving gay and lesbian couples the legal right to marry. 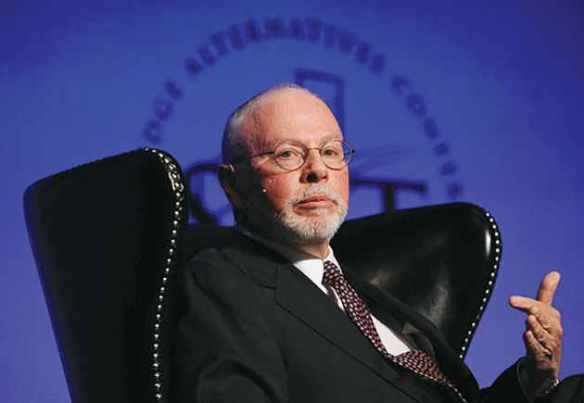 Every day around the world, LGBT individuals face arrest, imprisonment, torture and even execution just for being who they are,” said Paul Singer. “Some of the worst offenders in this area also happen to be the same regimes that have dedicated themselves to harming the United States and its democratic allies across the globe. [Emphasis added] As an organization that has been at the forefront of the equality movement for over three decades, the Human Rights Campaign is uniquely positioned to work in tandem with NGOs to empower LGBT and human rights advocates abroad and help stop these abuses. 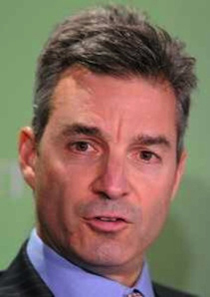 He has given more to the GOP and its candidates–$2.3 million this election season–than anyone else on Wall Street, helping make his hedge fund […] one of the nation’s biggest sources of political donations, the vast majority to the GOP. Curious how no one asks this. In gratitude for their generosity, HRC arranged for the two donors to feature in a puff piece yesterday by Frank Bruni, the New York Times’ designated homosexual. “Elliott Management’s lofty offices in Midtown Manhattan look north, south, east and west across the borough’s thicket of skyscrapers.” The view was terribly distracting for Bruni, who probably lives, like most Times writers, in a windowless Bronx tenement where he makes matchsticks to pay the bills. 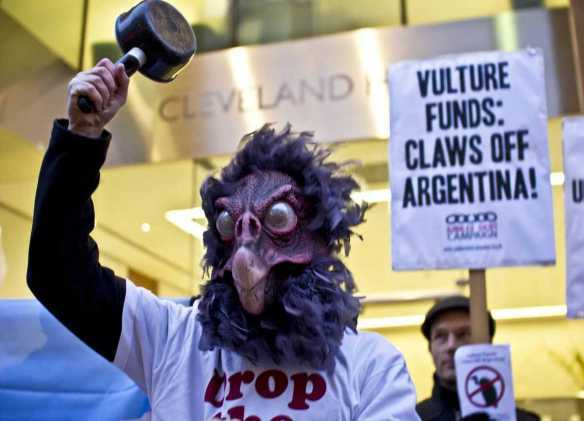 Paul Singer runs a vulture fund. He makes his profits from the debt incurred by Third World countries–I won’t use the PC term “developing” countries, because the point of the debt is to prevent them from developing–and from the misery it causes their citizens. 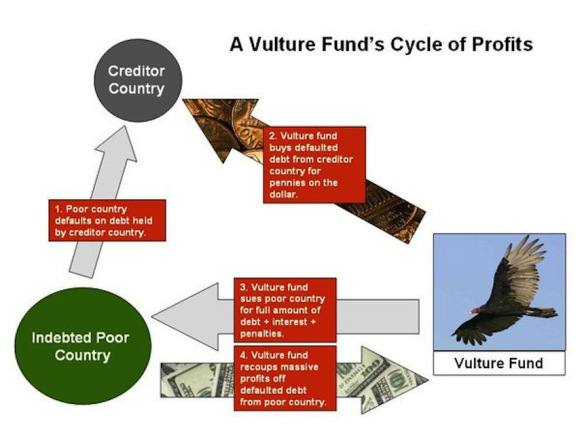 Of all the parasites in the global economy, of all the profiteers of poverty, vulture funds may be the worst. Congo-Brazzaville: In the late 1990s, Singer’s Elliott Associates used a Cayman Islands-based subsidiary called Kensington International to buy, at a discount, over $30 million worth of defaulted debt issued by the Republic of Congo (Congo-Brazzaville) — by some reports, paying only $1.8 million. It then sued the government for almost $120 million in repayments plus interest. That’s a 10,000% profit. A UK court handed Singer victory in a succession of judgements in 2002 and 2003. 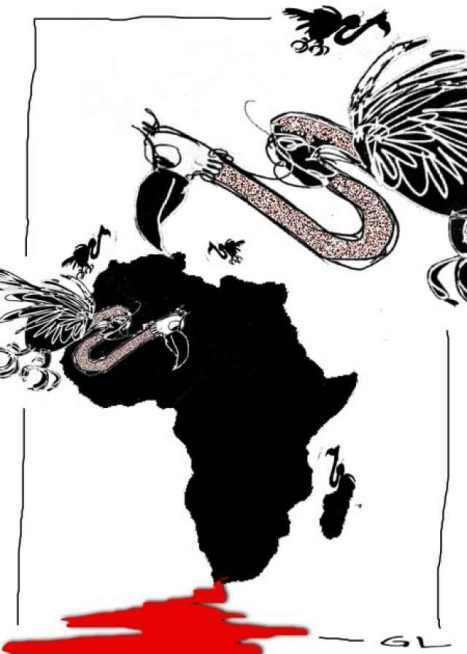 The Congolese government couldn’t pay up, though: interest continued to accrue at a rate of $22,008.23 per day. Congo-Brazzaville’s GDP per person at the time averaged around $800. More than a quarter of deaths of children under 5 were from malnutrition. The country had, according to the Financial Times, ”one of the highest foreign debts per capita of any developing country, estimated at $9 billion for a population of fewer than 4 million people” — and, following Singer’s model, private vulture funds hurriedly bought up about a tenth of that. Argentina:In 2001, Argentina had a revolution: citizens banging pots and pans in the public squares threw out a neoliberal regime that had driven the country into depression and stolen almost everybody’s savings. A new government of economic nationalists defied the Washington Consensus by defaulting on more than $80 billion in foreign debt and devaluing the currency. It worked: reasserting domestic control gradually revived the moribund economy. ‘International work’ done ‘for’ LGBTs (or women, development, girls, you name it) from the USA is, first of all, a great industry giving jobs to a vast majority [within the organizations] of USA citizens and also to a few privileged ones from the Global South (I was once among the latter, so I know what I am talking about). There are always a few good souls thrown in the mix, who normally can’t resist too many years. For too long our misfortunes (patriarchal social norms, authoritarian governments, condoned forms of violence, subordinated economies) have made the North rich, sometimes through jobs “saving us” and other times more directly, like in the case of the profits made by the vulture funds or the arms dealers. And they also serve to hide the existence of quite similar phenomena in the Global North itself and to keep the fragile national pride and self-esteem of our ‘saviors’ intact. is that a USA based ‘LGBT’ organization accepts money from such a source … [P]articularly in the USA many/most LGBT activists have a hard time linking their issues to broader social, economic and political realities, as they are too self-absorbed in all their identity politics. I hope that not many people in the Global South will agree to do work funded with this extremely dirty money — if they know where it is coming from. But sometimes, people are facing such difficult circumstances that they can’t afford to be so principled. I truly felt so sorry for him when he told me he had found himself unable to leave the country, curled up in a ball on the floor of his room crying, promising God that he’d do anything if the Almighty got him out of his predicament. It wasn’t as if Dan had done it on purpose, and who really knows what ended up happening to the kid?